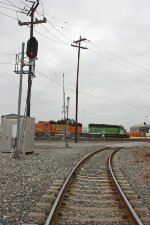 Description: Another intermodal hustles through town. 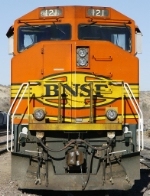 Description: Victorville road switcher with BNSF 121 rests her wheels. Photographed at 09:18. Description: Sad to see the once bright red AT&SF paint , now faded to a dull pink. Description: Tag! You're it! The paint on this unit actually wasn't too bad, until some one decided to add their own road name to it. Title: A GP60M in the consist! Description: If you look in the background, you can see the Amtrak train that had just departed (engine 464 from previous photos). Also note that The two GP60M's are consecutively numbered. Description: Amtrak 454 rolls southbound at Hobart. Description: BNSF 121 and 1827 idle at Hobart. Description: A Darth Vader light signal watches over the tracks coming up from the San Pedro sub into Hobart. Description: BNSF 7909 rushes past an idle GP60M BNSF 121.